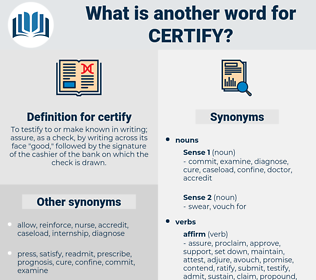 What is another word for certify? 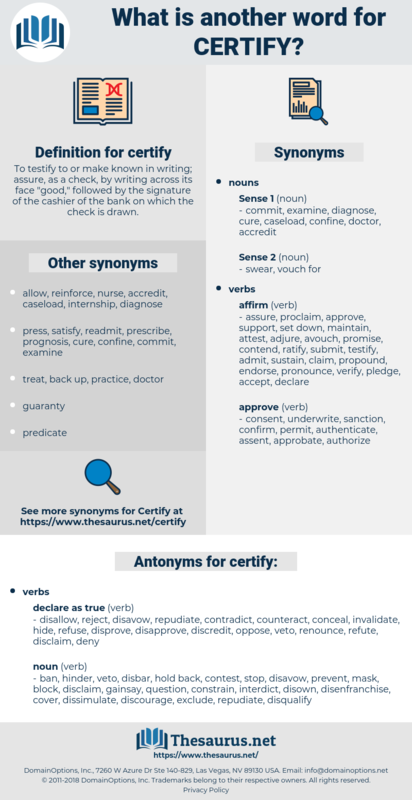 To testify to or make known in writing; assure, as a check, by writing across its face " good," followed by the signature of the cashier of the bank on which the check is drawn. Testified, confirmed, demonstrated, illustrated, reflected, recognized, proved, revealed, showed. testifies, evidences, confirms, validates, indicates, substantiates, demonstrates, signifies, declares, acknowledges, illustrates, reflects, exists, proves, reveals, supports, underscores, points, warrants, appears, shows, attests. testify, verify, confirm, validate, substantiate, assure, declare, ascertain, approve, vouch, identify, acknowledge, corroborate, reaffirm, justify, reconfirm, authorise, authorize, register, illustrate, endorse, check, establish. disallow, reject, disavow, repudiate, contradict, counteract, conceal, invalidate, hide, refuse, disprove, disapprove, discredit, oppose, veto, renounce, refute, disclaim, deny. impede, outlaw, hold back, question, prohibit, obstruct, disenfranchise, dissemble, challenge, prevent, discourage, contest, forbid, bar, disguise, hinder, dispute, shut out, disfranchise, proscribe, screen, cover, secrete, gainsay, disbar, mask, dissimulate, disown, ban, veil, disqualify, inhibit, exclude, enjoin, interdict, cloak, constrain, block, stop. He gave me to understand that, in order to remove all difficulties, it would be sufficient for a physician to certify that Chevalier was not in full possession of his faculties, and that he was not responsible for his acts. I trow she would come - since I can certify her that your reverence holds him for a holy man.